Friday will see a rare cosmic coincidence. Was Stonehenge used to predict eclipses? As the eclipse plunges Wiltshire and other places into darkness this Friday (March 20th), two other rare if less spectacular celestial events will be taking place, too: the Spring equinox and a Supermoon. Friday will see three rare celestial events and this will be the first time in living memory that the Spring equinox, a solar eclipse, and a supermoon are all taking place on the same day in the UK. One of the most intriguing mysteries in the world is the Stonehenge. Nobody knows who built the mysterious Stone Circle in Wiltshire, or what its purpose was exactly. There are many theories associated with Stonehenge and archaeologists have been debating for ages to determine why it was built. Most experts believe that Stonehenge is actually an ancient astronomical calculator. 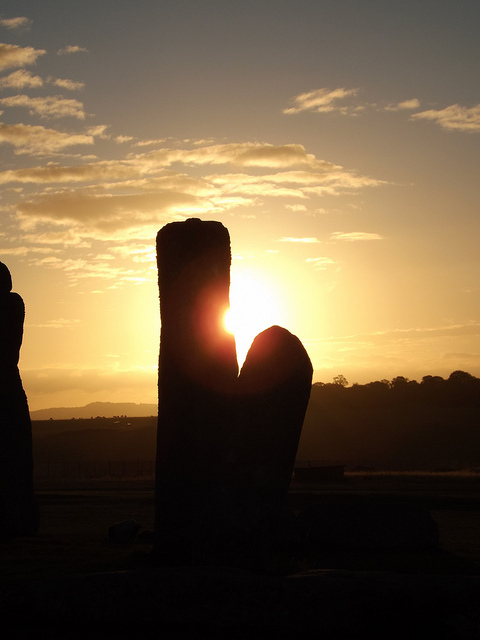 Now, it’s widely accepted that Stonehenge was used to predict eclipses. The inner “horseshoe” of 19 stones at the very heart of Stonehenge actually acted as a long-term calculator that could predict lunar eclipses. By moving one of Stonehenge’s markers along the 30 markers of the outer circle, it’s discovered that the cycle of the moon can be predicted. Moving this marker one lunar month at a time – as opposed to one lunar day the others were moved – made it possible for them to mark when a lunar eclipse was going to occur in the typical 47-month lunar eclipse cycle. The marker would go around the circle 38 times and halfway through its next circle, on the 47th full moon, a lunar eclipse would occur. Stonehenge has a ring of 56 pits that are now known as Aubrey holes, after antiquarian John Aubrey. They date back to the late fourth and early fifth millennium. These holes were not really noticed until the 1920s. It’s believed that the only standing feature at Stonehenge at the time these holes were dug was the Heel Stone – the marker of the midsummer sunrise – but this is now proven false. Some experts believe they were meant to hold timbers or more stones, but the astronomical interpretations of these holes are very interesting. It’s also believed that the holes helped to predict astronomical events. Complicated math theories back this up to some degree, as some lunar eclipses can be predicted by using numbers associated with Stonehenge. It’s even believed that Stonehenge was used to keep track of lunar cycles by moving marker stones two holes per day, ending with 56 holes. of Stonehenge. He set his data so that the positions of the stars and planets would match where they were in 1500 B.C., when he believed it was built, and found that 13 solar correlations and 11 lunar correlations matched up with the megalithic stages. In other words, he believed Stonehenge was used to predict astronomical events. He also believed that it was built to align with the position of the summer and winter solstices. A solar eclipse happens when the moon passes between the sun and the earth, hiding the sun from view and blocking out the sunlight that usually reaches us. The eclipse, which will be partial, not total, will begin here at around 8.45am on Friday and peak at around 9.30am before ending at 10.30am. It will be the biggest eclipse since August 1999. The equinox will also happen on March 20th. While it won’t have any discernable, direct impact on how the solar eclipse looks, it will contribute to a rare collision of three unusual celestial events. On March 20th, the Earth’s axis will be perpindecular to the sun’s rays — which only happens twice a year, at the two equinoxes. After that, it will start tipping over, making the days longer in the northern hemisphere. As such, the equinox has long been celebrated as a time of beginning and renewal, by a number of historic cultures, and is linked to Easter and Passover. The equinox will happen at the same time as a solar eclipse in 2053 and 2072, though it doesn’t always appear as close together as that. A very rare supermoon eclipse of the sun is happening this week that won’t take place again until 2034. A supermoon is when a full, or new moon coincides with the night when the earth and moon’s orbits move them slightly closer together, making the moon look about 14% bigger, and 30% brighter than normal. This generally happens roughly once every 14 months, but can happen more often; in January 2014, there were actually two supermoons in a single month. In the past, groups have argued that the supermoon could cause natural disasters, madness, or even throw the earth off its axis. Experts agree that the worst thing that might happen is the tide comes in another inch that night. As well as a supermoon, there is also an event when a full moon is as far away from earth as possible; this is called a micromoon, for obvious reasons. Remember that no one should look directly at the sun during a partial eclipse without proper equipment, as it can damage the eyes.